This is Khashyar Darvich, the Producer-Director of “Dalai Lama Renaissance,” “Dalai Lama Awakening,” and other films with life-affirming and transformational stories. I appreciate very much your interest in watching my films. Our intention in creating all of our films is to inspire, uplift and serve the Greatest Good of audiences. 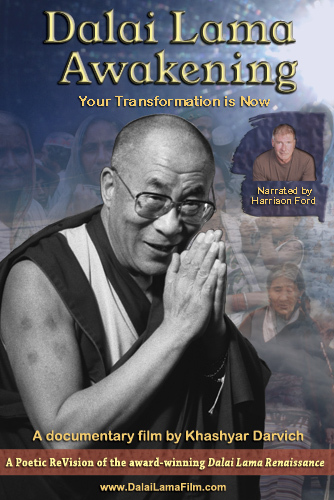 We are an independent film company, and I personally spent 7 years of my life and took out personal loans to be able to create ‘Dalai Lama Renaissance,” because I thought that it was important to share this important story with people around the world. Even though it was financially challenging for me to dedicate myself to making this film and sharing this unique story with others, I felt that it was important, and I made the commitment to finish the film with my own personal finances, no matter how challenging that road was. I still have personal debt that I accumulated in creating the film, which I was happy to do as a way of serving the Highest Good of others. I would appreciate very much if you do not download or upload the film except from our website, because this hurts my ability to pay off my personal debt with the film, and to be able to afford to create other films that I feel will inspire audiences and serve the Greatest Good. “Dalai Lama Renaissance” and our other films are not being released or distributed by a large movie studio, and instead, we decided to release our films independently ourselves, so that each film would be treated with care and so that we can maintain the film’s vision of having the film serve Humanity and the Greatest Good in the very best way. If you are able to purchase the DVD, or download them from our website, please consider it a way to support my efforts to choose to make films that have meaning and purpose, rather than producing films that have the primary intention of making money. I believe that service to others is more important than focusing on making money. If you are having a hard time affording to purchase our films, then please email me (Info [at] wakan.com), and tell me how much that you are able to afford to purchase a DVD or download, and I will do my very best to help you. Thank you very much for respecting all of the time and effort and personal resources that I put into making this film, which I hope blesses everyone who sees it.